Marion Bartoli caused one of the biggest shocks in Wimbledon history as she defeated world number one Justine Henin in the semi-finals. The world number 19 will face Venus Williams in Saturday's final after a sensational 1-6 7-5 6-1 win. Henin raced through the first set in 22 minutes but the big-hitting Bartoli got the better of a second set featuring seven breaks of serve. And the Frenchwoman hit stunning form in the third as Henin crumbled. "I can't believe it. 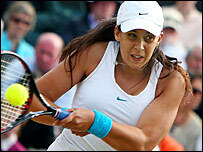 I'm so excited," the 22-year-old Bartoli told BBC Sport. "It's a dream come true. If you told me that I would make the final before the tournament, I wouldn't have believed you. "I didn't start well. It was so stressful being on Centre Court for the first time. But then I saw Pierce Brosnan in the crowd and he's one of my favourite actors so I just tried to play a little better. "I tried to just forget who I was playing and where I was playing and I started to play very good at the end of the second set and in the third set." Henin could not wait to get off the court after a shocking defeat which means the Wimbledon title is still missing from her collection. She said later: "I still don't understand what happened. "I played a good first set then had a couple of chances in the second and then the match turned. It's pretty hard to take right now. "But it's life, it's tennis. She was the best today - that's all I can say." However, Henin did admit that she did not feel "fresh enough to compete" in the third set. "I don't think it was pressure. I lost a lot of energy the last few weeks - winning the French Open and then my quarter-final against Serena was tiring emotionally. It was hard to be at my best." The Belgian had been a huge favourite to line up against Venus on Saturday in what would have been a repeat of the 2001 final. Henin, who beat Bartoli 6-1 6-3 at Eastbourne in the lead-up to this year's Wimbledon, has won more titles this year than the Frenchwoman has collected in her entire career and Bartoli had never got beyond the fourth round of a Grand Slam before her surprise run here. And Henin seemed to have one foot in the final after overwhelming Bartoli in the first set and then breaking serve in the opening game of the second. But as the top seed went into cruise control, Bartoli suddenly found her form, pressurising her opponent's serve with some crunching returns. The 22-year-old, the French number three, got the better of a topsy-turvy second set and then surged into a 2-0 lead in the decider. Henin had two break-back points in a long third game but after losing that, she could find no way back. With the bewildered Belgian now making a succession of errors, Bartoli was able to serve out the best win of her career to love.